Why Doesn’t My Apartment Allow Certain Dog Breeds? Does anything light up a household more than a loyal and loving pet? Our Springs Apartments communities are pet-friendly because we want residents to be able to enjoy this wonderful experience in their apartment homes. 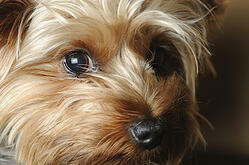 We do, however, have a couple exceptions when it comes to dog breeds that we can accommodate. Because the comfort and safety of our residents is our number one priority, we do have some rules regarding breeds. The guidelines are not based on size (we do not have weight restrictions) as many other apartment communities have. They are based on the aggressiveness or perceived aggressiveness of the breed. We admit this can get us into some disagreements with prospective renters who insist that their Pit Bull, Rottweiler or Doberman is the sweetest dog around. No matter how sweet a single dog might be, the public perception of those restricted breeds has to be considered. If our residents are fearful because they see a certain breed in the community, that takes away from their comfort. This breed's gentle, playful nature makes them a popular choice for homes with children. They're highly adaptable to any lifestyle and don't require a lot of exercise. Dachshunds do tend to gain weight easily, so be sure to follow a structured eating schedule. If you're looking for a cuddly lap dog, this breed fits the bill. Yorkies have charm to spare, so be prepared for people to stop and admire your pet when you're out for a walk together. They also have brains to go with their beauty so they're easy to train. Who can resist that adorably wrinkled face? Pugs are affectionate and loyal, so they're happy just being around you. Their easy-going nature makes them content whether they're out for a walk or snoozing at home. Keep in mind that the folds in their face require regular cleaning. The tuxedo-like coat of this breed gives them a stately appearance, and they have a polite demeanor to match. These dogs are quiet and maintain a fierce loyalty to their humans. This breed's royal name is contradicted by their quietly loyal nature. They are similar in size and temperament to Boston Terriers and kids can't resist their long, floppy ears and rumpled look. Despite this breed's tenacious-sounding name, in reality they are loyal and patient, making them another good choice for families. English Bulldogs are the couch potatoes of the canine world so they're ideal if you don't have much time to take them out for walks. If you’re considering a dog, you can’t go wrong with what the American Kennel Club has to say. Have a look at their recommended breeds for apartments: http://www.akc.org/dog-breeds/best-dogs-for-apartments/. Do you have more questions about our pet policy? Our team at Springs Apartments will be happy to provide you with more information. Just give us a call.